I've never been much of a collector - could never afford it really. I always kept the old guitar until I was entirely happy with the new one, then I sold the old one. I've only owned a few 'working' instruments - I bought a Yamaha FG-110 from the Ivor Mairants Music Centre in 1970 and remember spending several hours in the place deciding which of the six available would be the one I took home. The guys there were terrific and left me to it and didn't appear to mind at all that I would only be spending the princely sum of � that day. In 1972 I bought my first Martin, a 000-18. It was around the time that Martin prices suddenly fell dramatically - for years and years a 000-28 cost �0 (a fortune) and then the price came down to �5. Still too much for me, so I very happily settled for the cheaper 000-18 for �5. (A few months later the price fell even further, to �0.) Anyway, I was delighted to own a Martin and was happy enough with the guitar until one day in 1974 when I went to Brighton on an errand. Keith Johns was a fabulously talented guitar repairer who shared a flat in Kemptown, Brighton with a couple of incontinent parrots and a host of stupendously expensive instruments entrusted to his care by their very fastidious owners. My brother Mark wanted some work done to his '46 000-21 and I offered to deliver the guitar to Keith. He was a real character who seemed to wave a magic wand over broken instruments and make them perfect again. As well as repairing guitars Keith usually had a couple of instruments for sale - generally stuff he acquired as payment for his labours. One of these was a 1924 mahogany-bodied Washburn - a model 5200 - that I absolutely fell in love with from first sight and sound. Fabulously responsive with an explosive top end but a neck like a tree trunk. A big tree at that. It was quite something - I've always thought that as the neck had no truss rod it was made so large to guard against warping. Well, I can report that the system worked - the neck was as straight as a die. I used the Washburn for many years, and it featured on my first solo album in 1981. The following year I met English luthier Russell Wootton, who was interested in making small bodied instruments. He took all the measurements from the Washburn and went home and got busy. A few months later he came to my house in Bristol with the replica that I actually liked better than the original. It was a remarkable guitar. Very, very loud and even pokier at the top end than the Washburn. And with a sensible neck. After a few adjustments I started using the guitar fulltime and it featured on solo album number 2 in 1983. It was a really fine instrument, and the only one I regret selling. In the early eighties my brother ran a small music shop in Yorkshire that I'd visit from time to time when I was in the area. In September '84 I popped into the shop and while chatting had a look at the instruments on the wall. There was an old 1930 OM-18 in that day that was the result of some trade done with another dealer - a fabulous guitar. Needless to mention, I bought it, and it remained my main, indeed only, instrument until June 2000. It went with me all over the world for 16 years without a scratch, albeit in an incredibly heavy flight case. In 1992 I met Martyn Banks from Oakwood instruments who expressed an interest in copying the OM-18 in much the same way that Russ Wootton copied the old Washburn a decade earlier. He did a great job on the replica - although the construction was different from the original, the essential spirit of the old guitar survived. The replica was really light and very responsive, and has since become a stock model for Oakwood. Since then the neck of the old OM-18's been reset courtesy of ace repairer Mark Challinor and is once again back to A1 playing condition. I've even thought about taking it out again, but the low profile neck on the -42 is just too easy to play. Since I was a kid I always fancied a decent electric guitar, and so a few years ago bought a Fender Stratocaster from a shop in Albany, NY. It's great fun to mess around on, especially through the Pod amp simulator. 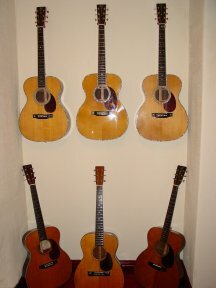 In May 2003 I realised an ambition and visited the Martin factory. I had no idea it was all on such a massive scale - the whole thing was most impressive. Take a look. A few months ago my brother Mark dropped by with his guitars and we had quite a display.